How does the revolution in Rojava fit into the Syrian Civil War? With the advent of a Trump presidency fast approaching, the American Left appears despondent and discouraged. They may take potential hope from a series of remarkable events happening amidst the bloodshed of the Syrian Civil War. The northern areas of Syria have long been home to a substantial Kurdish population. 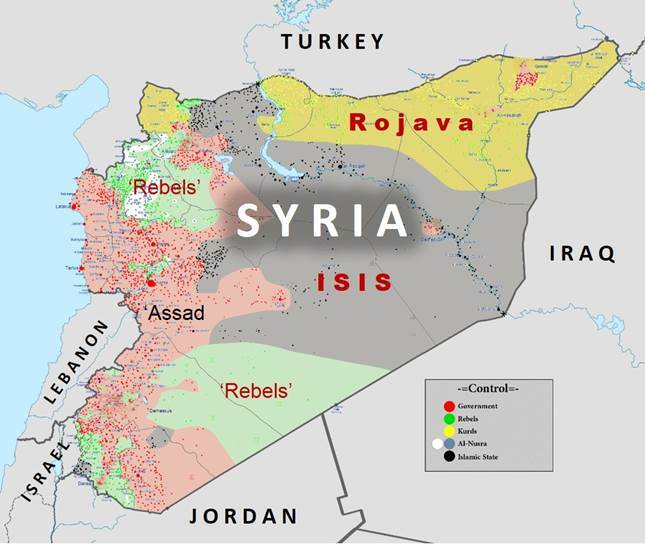 In 2011, when hostilities of the civil war began, Kurdish militants drove out Syrian government forces and established an autonomous zone known as Rojava, meaning “The West” of theoretical Kurdistan. But Kurdish self-determination is only one aspect of the struggle for Rojava. Within the areas controlled by the Syrian Democratic Forces, a multiethnic coalition created to fight ISIS and other belligerents, nothing short of a revolution has taken place. SDF and Kurdish personnel have experimented with Athenian-esque direct democracy, racial and gender equality, and participatory economics. Many (including The Guardian) have compared Rojava’s innovations in governance to the brief period of anarchist control in Spanish Catalonia during that country’s own civil war. The achievements of Syrian Kurdistan are nothing short of miraculous. Based on direct democracy methods articulated by American philosopher Murray Bookchin, Rojava is a confederation of democratic municipalities. Women have a 40% quota in every assembly. Non-Kurdish ethnicities enjoy affirmative action and relative equality. Economic cooperatives are encouraged to promote egalitarian and environmentally sustainable autonomy. In the midst of a religious and political civil war that has taken close to half a million people’s lives, this functioning leftist democracy is an achievement. In addition, SDF and YPG (People’s Protection Units, the military arm of Rojava) have proved to be perhaps the most effective force against ISIS, even according to US military personnel. But just like the Spanish Revolution of the mid-1930s, crushed by Stalinist Communism, Rojava remains isolated and fragile. It has an uneasy, on-and-off truce with the Assad regime, though Assad insists that Kurds don’t want self-determination. The looming threat to Rojava is Turkey, which is understandably concerned with YPG’s ties to the Kurdistan Workers’ Party (PKK), an insurgent group active in Turkey. An offshoot of the PKK recently executed a bombing campaign on Turkey military targets. This in turn led to further repression of Kurdish organizations within Turkey, evidence of Erdogan’s increasingly authoritarian rule. Turkish forces, during excursions into Syria, have targeted not only ISIS but YPG and Kurdish groups as well, claiming they are the equivalent of the PKK terrorists in Turkey. The United States is a supporter of both Turkey, a NATO ally, and Rojava, indirectly: At the continuing siege of Mosul, US troops have provided training, logistical support, and airstrikes to the YPG in their struggle against ISIS. Therefore the US is in a contradictory position, supporting two opposing forces. Likely, support for one will lead to termination of support for the other. It is difficult to imagine President-elect Trump supporting a far-Left, stateless insurgency over Turkey’s authoritarian stability. He is, after all, a businessman, and is more likely to be favorable towards keeping Turkey in the US bloc than he is towards Kurdish self-determination and socialism. Thus the future of Rojava may fall, in part, into the hands of the Left outside of Syria. It remains to be seen if activists in the West and beyond will help Rojava survive, either by pressuring their governments for support or by joining the fight themselves: thousands of foreign fighters journeyed to northern Syria to help defend the revolution, including one recently deceased American. If this trickle of funds, state support, and fighters becomes a flood, Rojava could survive to become an enduring experiment in human freedom. Previous Post:Rex Tillerson: What does he really think about climate change? Who knows?